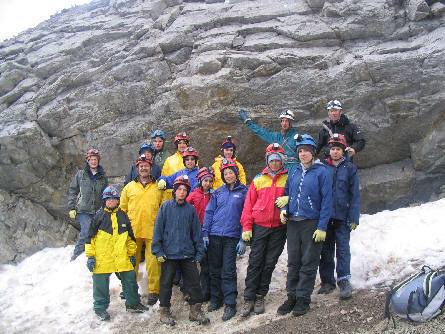 A great backcountry adventure for younger campers! After a day of kayaking at nearby Fish Lake, we will move to our backcountry campsite for the next four days. From this beautiful campsite under a huge natural rock roof, campers will head out for a different adventure each day in the surrounding cliffs and mountains. 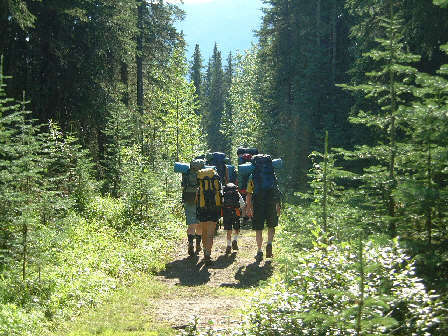 Note to Parents: This camp takes place in a low elevation setting, about 2km from the road. It is the perfect introduction to backcountry camping while maintaining easy access to the road in case of illness or other problems. From our lodge, our instructors can reach the backcountry site in approximatly half an hour if need be. All trips will have a minimum of one female and one male instructor. We feel this is a very safe venue for younger campers and will provide them with an unforgettable experience. · Learning survival skills (shelter building). · Story telling, and lots more! When you arrive at COE you will spend the first evening getting to know your Instructors and all of the rest of the campers. The next morning, after a big breakfast, you will head to the lake for a day of kayaking and playing in the water. On day 2 you'll pack up your packs, tents, stoves, and food and hike into your home for the next four days! After you set up your new home, you'll cook your dinner, play some games, and enjoy a night in your tents. Each day we get up pretty early, to get a head start. After a big breakfast you'll grab your gear for the day and head out for an adventure in the mountains with your new friends. · Clothing (track suit for running, running shoes, sweaters, socks (lots), shorts, T-shirts and sweat pants) Avoid jeans except for indoors. · Warm jacket (fleece best), Warm pants (not jeans). · Sleeping bag (should be one that can be packed in a back pack with lots of room to spare) good to minus 10. · Lightweight Sleeping Pad (blue foamie or thermarest) - available for loan if required. · Most important of all is a good pair of hiking boots(best) or hiking shoes!! · Make sure to properly label all of your gear. Please avoid bringing valuables to camp. We will not be responsible for lost or stolen articles. · MP3 Players, Walkmans, etc. download a PDF of our Registration form. Mail or e-mail in forms with a $150 deposit to hold your child's spot on the camp. Drop off time is 4:00pm Sunday at COE. Pickup time is noon Saturday at COE. Please be on time. Thanks!.